Porsche looks all determined to bring the 911 family together. At the Frankfurt Motor Show 2015 they gave wings to this statement by unveiling the Porsche 911 Carrera 4 2016. With this powerful beauty they also unveiled the Targa 4. Both these models come with an All Wheel Drive system and lot many other features and comfort elements. Let us have a look at the review of Porsche 911 Carrera 4 2016 know more about it. The interior of Porsche 911 Carrera 4 2016 has some notable changes when compared to the model it replaces. Talking about these changes the first one is the thicker steering wheel featuring better grip while the chrome spokes get a more pleasing look in comparison to the predecessor. There is also a seven-inch multi touch display offering better PCM connectivity and infotainment systems with an all new navigation system. Apart from these the rest remains same including the center console and stack, gear lever and the door panels. Which I firmly believe is a positive sign. Afterall there isn’t any harm in carrying forward what’s already good. Thus rounding up the entire interior details of Porsche 911 Carrera 4 2016 I would say, though there are minimal changes but those integrated are enough to make it look different and serve better. The exterior of Porsche 911 Carrera 4 2016 has more changes in comparison to the interior. Starting with the front fascia there is a redesigned bumper with housed air-ducts on it. The latter gets better look and thus add to the overall appearance. The oval shaped headlights get a new member in house with the four-point daytime running lights. Moving towards the rear fascia you’ll notice a sculpted body featuring creases over the wheel arches and side sills. The mirror housings too get a larger house while the recess over the door handles has been eliminated. The rear end the taillights get connected through a thin light strip and give the broadened rear a touch of gorgeousness. 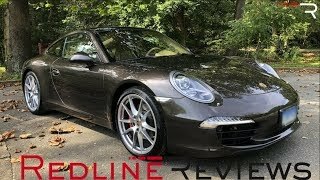 In all rounding up the exterior details of Porsche 911 Carrera 4 2016 I would say it has everything to make you leave a distinct entity over streets. Beneath the hood of Porsche 911 Carrera 4 2016 is a 3.0 liter six-cylinder engine cranking total output of 70 hp and peak torque of 450 nm mated to seven-speed manual transmission as standard with an option to go for PDK transmission and Sport Chrono Package. 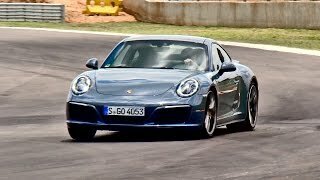 With this power rolling the model, top speed of Porsche 911 Carrera 4 2016 touches the mark of 181 mph while the 0-62 mph sprint can be knocked in 4.1 seconds.